I originally attempted to climb to the highest point in Connecticut – Mount Frissell (south slope) – in March a few years back and the summit was snowed in. I should have known better, but learned my lesson. This was my first chance to attempt the summit again. Debi was willing to give it a try and Toren would be riding on my back. My guide book says that it is just a mile or so each way from the trailhead, which is pretty close to accurate, but this is not a particularly easy hike. That was even more the case since I was carrying my son on my back and the trail was basically a stream since it had been raining pretty much non-stop for the previous week. We drove in from Poughkeepsie, through Salisbury, CT (see below) and had no problems on the road in our Prius. 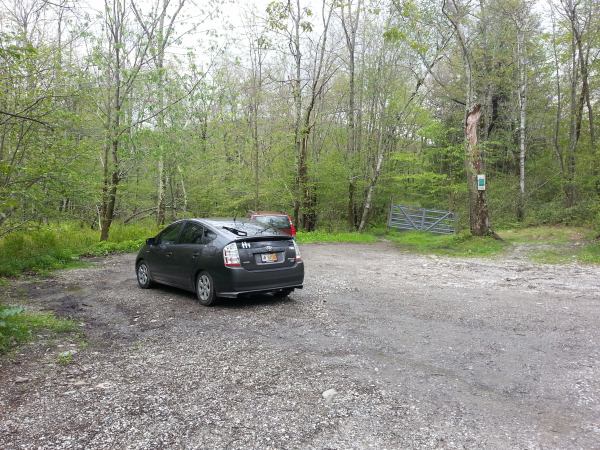 We arrived at the MA/CT state marker then backtracked to the spot where you can park (by a gate with a sign in a tree). Here is where you park. 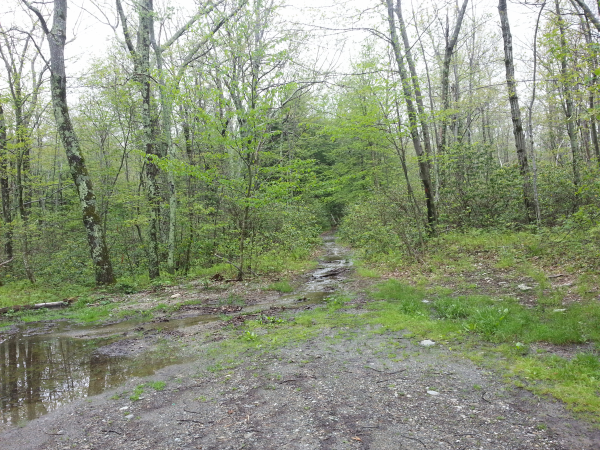 The trailhead is 100-200 feet north. I had nice hiking boots that are waterproof up to the laces so I was fine, but Debi’s feet were soaked almost immediately. Even so, we pressed on, until we got to a really rocky section. The red blazes in the trees were easy to follow until we got to the top of the rocky section when we lost them. We searched for about 10 minutes for blazes but couldn’t see any. For the first time in my hiking career, I got so turned around that I actually mistook one of the blazes we had already passed for the one we were supposed to follow and we ended up going back down the steep, rocky section thinking that was where we were supposed to go. Eventually, I checked my GPS and realized we were backtracking, so we turned back around, re-ascended the rocks, then found the red blaze. From there it was another 30 minutes or so from the highpoint. 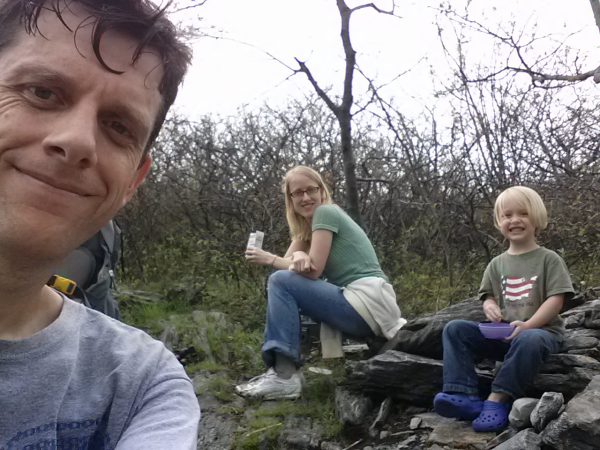 By the time we finally made it, we were pretty tired since it was wet, muddy, and we’d hiked the worst part twice already! For those hiking this, make sure you know that there are blazes on rocks as well as trees (that’s what we missed). We didn’t stay long as a storm was blowing in. We hiked back out pretty quickly and made it back just in time for the storm to hit.